Knock offs are nothing new. This is something that has become clearer to me as vintage counterfeits keep flooding the secondary market — auctions, consignment shops, thrift stores and flea markets. Here are some 1990s examples of old fakes that I have come across recently. 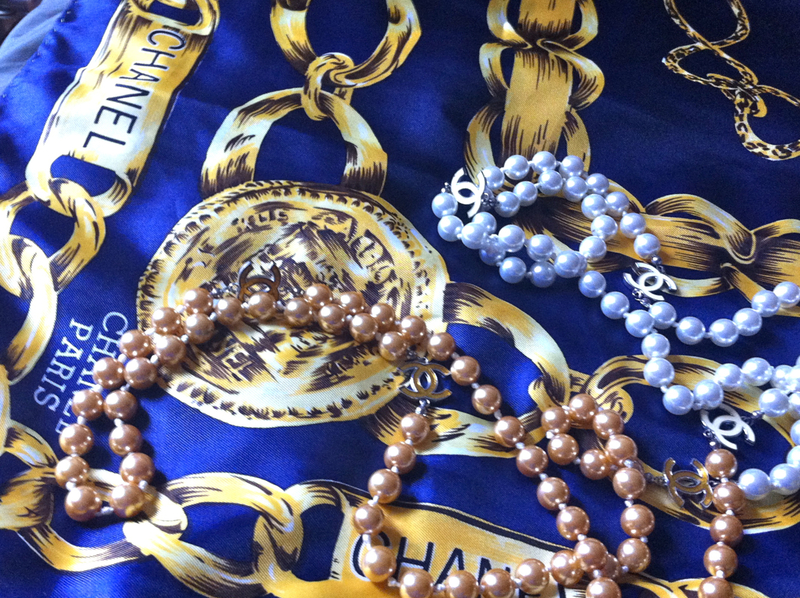 Above, a Chanel “Chains” scarf and CC logo pearl necklace. 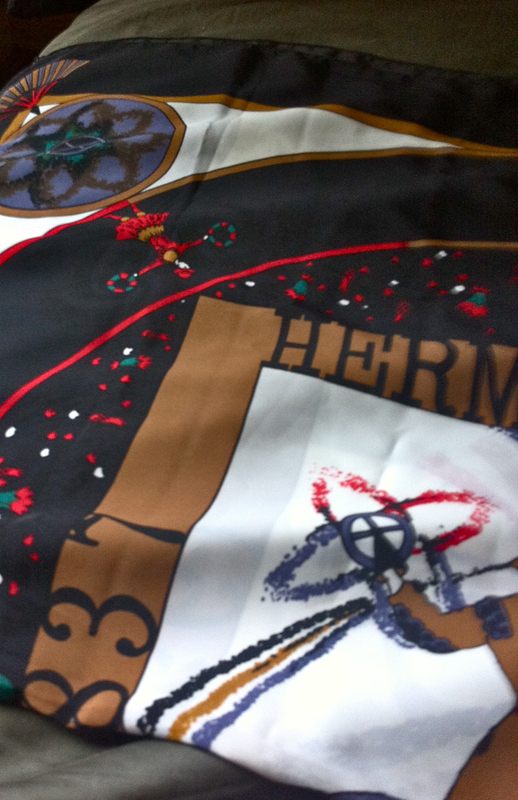 Below, an Hermès “hermes feux d’artifice” scarf. It can be difficult to now what to look for when trying to figure out if a vintage piece is authentic of counterfeit. First of all, you can’t go into a store and compare against the present day version. Designs and logos evolve over time and if you do find a match on the internet, it’s entirely possible that the piece you are comparing it to is a fake as well. The web is also full of experts with incorrect information. And finally there’s human nature: We all secretly want to believe that the too-good-to-be-true Value Village find is the real deal. In the case of the pieces pictured here, it all comes down to quality. I’ve had real Chanel scarves and while this piece is beautifullly printed, the giveawys were that the edges were machine finished (not even rolled) and the weight of the material just didn’t feel right. The necklace is hand-knotted between the faux pearls and the beads are glass not plastic, the hardware connecting the stations to the pearls is cheap. The Hermès scarf, on the other hand, is good silk and has a handrolled finish, but the counterfeiters cut corners in the printing. The scarf lacks all of the nuance in the fireworks, the typography is too big and clumsy, the printing isn’t as crisp on one side of the scarf, the edges are hand tolled but in the wrong direction and, most importantly, the original scarf was printed to honour Hermès’ 150th in 1987. This scarf has the year 1992 printed on it. In a nutshell. If something feels off, it’s probably a fake.